In their desperation to escape untenable conditions in their homeland, they embark on a route and in vessels that is at best treacherous. 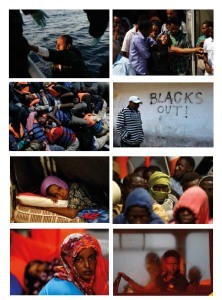 Even when disaster does not strike at sea, the condition of their travel is horrific. Their journeys of desperation represent one of the most horrific, cruel, yet important immigration routes of our time. Untold hundreds have died attempting to make the crossing - the central Mediterranean has become their graveyard. Over time, I have captured the journey of the asylum seekers that begins with their rescues far out at sea, to arrival on the island and life in the detention camps through to the open centres where they go to live once released from detention, and life in the community. 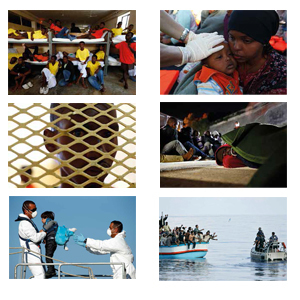 Over 19,000 immigrants and asylum seekers have come to Malta in the last 10 years. Around 5,000 remain on the island, living in detention centres, open centres or in the community. They claim their intention was never to arrive in Malta - but rather go to Italy where they could easily move on within the European mainland. The influx of immigrants has tested the Maltese people's reputation as a hospitable people. It has also strained the resources of the Armed Forces of Malta, which is responsible for a rescue region stretching from Tunisia almost as far as Crete to the east, covering some 250,000 square kilometres. My passion for this story has never faltered since first being exposed to the suffering of these people and the thinly veiled inhumanity in the reaction of first-world nations. Even at times when many felt the arrival of immigrants no longer constituted news, I kept at it, drawn by the challenge of coming up with powerful images, trying to go beyond the news to show something different every time that would capture the depth of suffering and embody the vital importance of the overall story in human terms. All of these photographs were taken on assignment for Times of Malta and Reuters, using natural available lighting only. Being photojournalism, nothing was set up, re-created or posed - everything was shot 'as is' at that moment in time. Photoshop use was also kept to a minimum as per normal ethical standards on the use of Photoshop in photojournalism. In December 2014, I published the book, Isle Landers, on the topic.